Press Release "SafeAvio Steps forward for Implementation"
According to the "White Paper on Land, Infrastructure, Transport and Tourism in Japan" (2010), more than 50% of domestic airline accidents over the past 10 years were caused by turbulence. Presently, a turbulence accompanied by rain clouds can be detected to some degree by a passenger aircraft using weather radar and/or by consulting weather forecast in advance, but it is difficult to foresee possible turbulence unaccompanied by rain clouds (clear air turbulence). If turbulence were perceivable in advance, various measures may be taken such as bypassing the turbulence affected area or, when that is not possible, turning on the seat-belt sign or suspending cabin service so that reduction of accidents can be achieved. The R&D of onboard safety avionics technology to prevent turbulence-induced aircraft accidents (SafeAvio) mission will develop onboard Doppler LIDAR capable of detecting once-undetectable clear-air turbulence and conduct flight demonstrations of its system for preventing turbulence-induced aircraft accidents, which provides pilots with turbulence-related information. 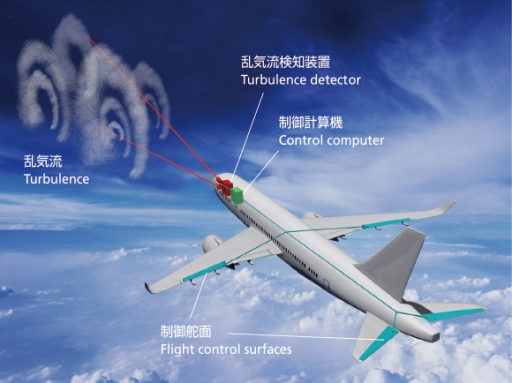 By combining information on the detected turbulence with aircraft attitude control systems, the project will also develop gust alleviation technology that suppresses sudden aircraft shake caused by turbulence. By emitting a couple of laser beams from an aircraft, receiving scattered light from aerosol particles (fine water drops and dust, etc.) suspended in the air, and analyzing light wavelength variation caused by the Doppler effect, a Doppler LIDAR can determine transitions in airflow - otherwise known as turbulence - based on wavelength variation. This makes it possible to detect clear-air turbulence that the weather radar on most aircraft have failed to identify. At high altitudes over 10 km, at which passenger aircraft cruise, the aerosol density drops, and scattered light weakens so that a more powerful laser beam becomes necessary. 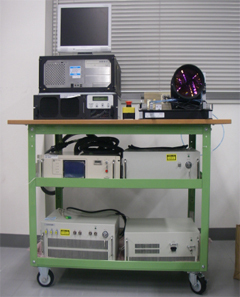 In 2011, JAXA developed a Doppler LIDAR weighing about 150 kg, which can detect turbulence about 9 km ahead at an altitude of 12,000 m. A flight demonstration in 2011 proved the system to be capable of detecting turbulence at high altitudes. 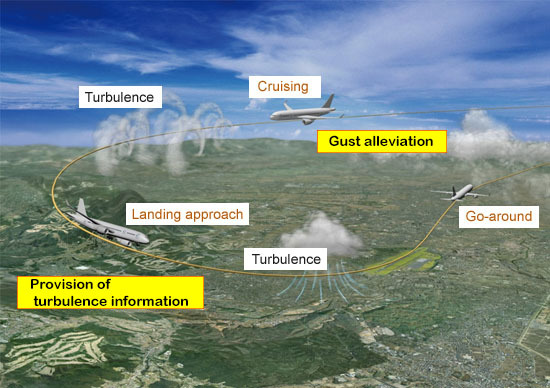 In February 2012, for the first time in the world, JAXA successfully detected clear air turbulence in advance in flight. The Doppler LIDAR developed to date has reached a technically sufficient level for practical use, and can be made even smaller if used exclusively at low altitudes and low speeds, such as during takeoff and landing. This technology warns a pilot with an alarm to avoid danger when turbulence is detected during landing approach. Video: Simulation results comparing the effects of turbulence inside the passenger cabin with and without gust alleviation technology (1:02) The right side shows a cabin for which vertical heaving (vertical acceleration) is cut in half by applying gust alleviation technology, while the left side shows a cabin without any such measures. For high-altitude use, on top of pursuing miniaturization or power enhancement, we are researching and developing gust alleviation technology that reduces aircraft shake by automatically controlling the control surfaces (hinged flight control surfaces [ailerons, etc.] that control the attitude of the aircraft) based on estimated airflow vector data detected by two laser beams. Using this technology, we aim to help cut the number of turbulence-induced aircraft accidents by half. FLIGHT PATH No.13/14 "Challenges of the SafeAvio project"
FLIGHT PATH No.9/10 "To enable short-term R&D return: SafeAvio industry-academia-government collaboration"
FLIGHT PATH No.9/10 "Aeronautics in depth - Doppler LIDAR"
FLIGHT PATH No.3/4 "How SafeAvio detects turbulence in advance to help reduce shaking"
Aviation Program News No.26 "Capturing wind changes to optimize operation"